Bite your lip and pretend like you're not about to cry as you watch this new trailer for The Walking Dead Season Two, which will start December 17 with an episode titled "All That Remains." The first teaser was bad enough , but this one is just brutal. Along with flashbacks to some of the best lines from the first season, we see Clementine getting into all kinds of trouble as she tries to survive in the woods and alongside shady new characters. Once again, we get a glimpse at Omid, but no other characters from the previous season or the 400 Days DLC. The tiniest bit of detail, gathered from the description accompanying the trailer, is that Season 2 will start "many months" after the events of the first season. We figured as much seeing as how Clementine doesn't seem much older and is still in the same clothes she wore when we last saw her, but there you go. When I think back on the first season I can't point to one particular moment that made that game so worthwhile, and I think it's harder to get excited about a game that is so successfully bleak and emotionally exhausting. But when I watch the trailer, which is excellently edited, it all comes back to me. It's not about one particular moment, but a super effective, troubling mood that's created by great characters and writing. It remind me of how invested you can get in a game—a rare thing. I suspect that the fact that this season will focus on Clementine and will carry over decisions made in the first season will make me all the more invested. 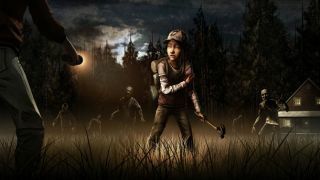 If you haven't already, you should definitely read our interview with Mark Darin , writer/designer at Telltale games, about what it was like to design a game with a pre-teen protagonist. You can pre-purchase The Walking Dead Season Two now on Steam for a 10 percent discount bringing it to $22.49.